The Majority of our products are produced and packaged by RBE in our Johannesburg factory. Consequently we have a substantial printing plant capable of long and short run print and finishing jobs. We are able to offer our services to customers to manufacture a large range of products customised to individual or corporate needs. Any paper cut to any size you want. Cartons, Boxes, Folders and much more. Saddle Stitch, Perfect Binding, Quarter Binding, Twin wire (Wiro) Binding and Case Binding. A variety of handwork options. Every Business needs to create and foster a corporate image and this all starts with Graphic design and Typography. The form it takes can be physical or virtual and can include images, words, or graphics. Starting with a logo and carrying through a concept which defines the character as well as the look and feel of the business, great design can work wonders. RBE Express makes it simple to create beautiful, crafted business stationery and promotional materials that will help you open doors, start conversations and grow you sales. Professional Quality, On Demand, Quick Turnaround, Short Run, Variety of media, and variable data. Digital Printing refers to methods of printing from a digital based image directly to a variety of media. 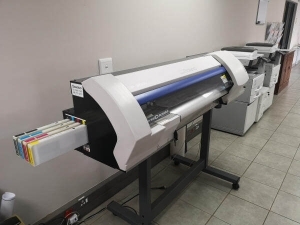 It usually refers to professional printing where small run jobs from desktop publishing (DTP) and other digital sources are printed using large format and/or high volume laser or ink-jet printers. Digital printing has a higher cost per page than more traditional offset printing methods, but this price is usually offset by avoiding the cost of all the technical steps required to make printing plates and prepare the printing press for the production run. It also allows for on demand printing, short turnaround time and even a modification of the image (variable data) used for each impression. The savings in labour and the ever increasing capability of digital presses means that digital printing is reaching the point where it can match or supersede offset printing technology’s ability to produce larger print runs of several thousand. High Quality, lowest cost for volume, larger sheet sizes, Colour matching and crisp images. Reel or sheet fed. Offset Litho printing is a printing process that uses special plates, usually made out of aluminium, that have a hydroscopic surface (water adheres to it) and carries an image surface that is water repellent and can transfer an image onto rubber blankets,which in turn rolls the image onto the surface (Paper) to be printed. This method is known as “offset” printing because ink is never directly transferred onto paper. Offset printing is suitable when large volumes of images need to be printed, and the colour reproduction must be crisp, accurate and clean. Offset Litho is most commonly used in printing books, magazines, brochures, catalogues, stationery and is widely used in the packaging industry. Setting up an Offset litho printing press involves making litho plates and registering them on the press which takes time and as such increases the cost per print run, Litho machines can run very quickly and accurately so the unit cost of production is low, this means that the longer the run, the lower the unit cost. 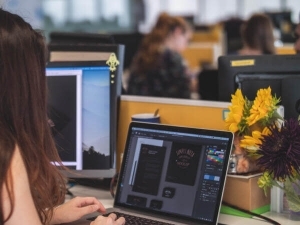 Modern technology is combining digital print technology with offset Litho printing to reduce machine set up time, thus reducing the cost of shorter runs. Colour control and consistency is easily controllable in the litho process and the operator can control the flow of ink through various micro adjusters on the press, this process is computer controlled in modern presses. 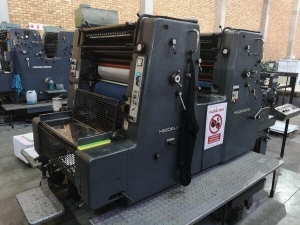 Offset Litho and other presses and machines are built to last and are considered long term assets in a printing business, this means they are not subject to rapid technology change and their purchase cost can be amortised over a long time and literally Billions of impressions.